We are pleased to announce that the IBP Makati Chapter shall be holding a 36-unit MCLE seminar on January 23 & 30 and February 6 & 13, 2015 (Fridays) at the A. Venue Suites in Makati City. 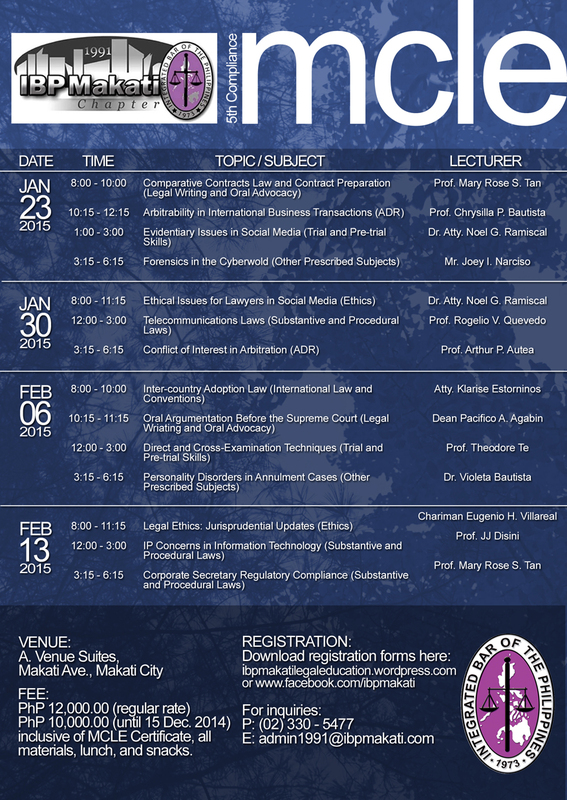 For details on the topics, lecturers and schedules, please refer to the poster below. This entry was posted in Uncategorized on October 29, 2014 by IBP Makati Legal Education. Labor law; Payment of accrued wages despite reversal of decision. An employer, who, despite the Labor Arbiter’s order of reinstatement, did not reinstate the employee during the pendency of the appeal up to the reversal by a higher tribunal may still be held liable for the accrued wages of the employee, i.e., the unpaid salary accruing up to the time the higher tribunal reverses the decision. The rule, therefore, is that an employee may still recover the accrued wages up to and despite the reversal by the higher tribunal. This entitlement of the employee to the accrued wages proceeds from the immediate and self-executory nature of the reinstatement aspect of the LA’s decision. Exception. By way of exception to the above rule, an employee may be barred from collecting the accrued wages if shown that the delay in enforcing the reinstatement pending appeal was without fault on the part of the employer. To determine whether an employee is thus barred, two tests must be satisfied: (1) actual delay or the fact that the order of reinstatement pending appeal was not executed prior to its reversal; and (2) the delay must not be due to the employer’s unjustified act or omission. Note that under the second test, the delay must be without the employer’s fault. If the delay is due to the employer’s unjustified refusal, the employer may still be required to pay the salaries notwithstanding the reversal of the LA’s decision. This entry was posted in Labor Law on October 23, 2014 by IBP Makati Legal Education. Labor law; Retrenchment differentiated from redundancy. Retrenchment and redundancy are two different concepts; they are not synonymous; thus, they should not be used interchangeably. Retrenchment, on the other hand, is used interchangeably with the term “lay-off.” It is the termination of employment initiated by the employer through no fault of the employee’s and without prejudice to the latter, resorted to by management during periods of business recession, industrial depression, or seasonal fluctuations, or during lulls occasioned by lack of orders, shortage of materials, conversion of the plant for a new production program or the introduction of new methods or more efficient machinery, or of automation. Simply put, it is an act of the employer of dismissing employees because of losses in the operation of a business, lack of work, and considerable reduction on the volume of his business, a right consistently recognized and affirmed by this Court. A corporation whose principal office address in the Articles of Incorporation is specific, complete or fully compliant with relevant Circulars need not file an amended AOI if moving to another location within the same city or municipality. However, it must declare its new address in the General Information Sheet within 15 days from transfer to the new location. This entry was posted in Commercial Law on October 23, 2014 by IBP Makati Legal Education.